You could spend days just exploring Trier and its fascinating sights. If you find yourself with extra time to spare, or simply want to mix it up, you’ll be delighted to hear that the region boasts all kinds of thing to do. Vineyards, scenic towns and natural wonders, all are within reach, and we’ve rounded up the best day trips to take from Trier. 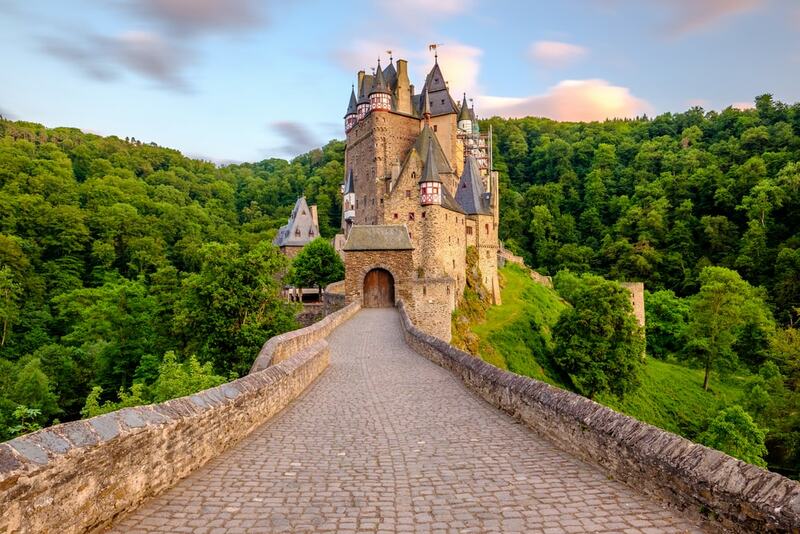 All your knight and damsel dreams come to life when you first catch a glimpse of Eltz Castle through the tree canopy of the surrounding forest. This magical 11th-century castle is perched on a rock near the Moselle River, 105 kilometres (65 miles) northeast of Trier. The iconic medieval façade of the beige bricks, the red-and-white timber structures and the grey-shingled turrets are a popular photo motif – and in their own right – but the thick castle walls also hold a fascinating exhibition, which is best explored as part of a guided tour. Since the border to Luxembourg is only a stone’s throw from Trier’s city boundaries, it’s worth looking at what this neighbour has to offer. Echternach is Luxembourg’s oldest town and also ranks among its prettiest. The historic town centre feature a Gothic market square and the remains of the medieval city walls are still visible. Add a visit to the Abbey of Echternach, the Roman Villa and the Basilica of Saint Willibrord to your list, and your trip back in time is complete. From Trier, it’s only a 40-minute drive. The Moselle region lures with rolling, vine-clad hills that produce some of Germany’s best wines, scenic views and dreamy villages. Bernkastel-Kues is one of them and can be reached via a 40-minute drive from Trier. The cobbled alleys and roads of the picturesque town centre are lined with half-timbered houses, quaint wine taverns and wineries, and make it the perfect wine-tasting destination. Bitburger is one of Germany’s premium pilsner beers and has called the Eifel town of the same name home since 1817. Beer fans shouldn’t miss out on a trip to Bitburg, which is only 30 kilometres (18.6 miles) north of Trier, to learn about the brewing process. Rather than a traditional brewery tour, Bitburger has opened a multimedia experience that explores the company’s history and the brewing process through info panels, video material and interactive stops, including taps where you can taste the brewing water. The entrance fee covers a guided tour, which runs every hour, and beer samples at the end. A 45-minute drive south takes you the Saarland State of Germany and one of its major attractions. A couple of years ago, a tree-top walk opened up to give a better view of a dramatic loop of the Saar River, which cuts its way through the forested area here. Once you’ve got your fill of the spectacular views from up top, you can combine the trip with a visit to Montclair Castle, the ruins of a medieval fort. Clervaux in northern Luxembourg is a mere 80 kilometres (50 miles) from Trier and has a whole bunch of activities and sights in store for a day trip from Trier. Make sure to visit the two abbeys of Saint Maurice and Saint Maurus and don’t miss out on Clervaux Castle, which is perched on a hill just outside the town centre. The fort houses a couple of fantastic exhibitions: The Museum of the Battle of the Bulge is dedicated to a devastating World War II battle, and The Family of Man showcases the works of Luxembourgian photographer and museum curator Edward J. Steichen. Cochem is another one of those gorgeous Moselle towns that offers a concentrated version of the best things the wine country has to offer – vineyards, a picturesque town centre, stunning river views and a castle. These features make Cochem the perfect day-trip destination coming from Trier, which a good hour’s drive from here.